In what has been described as a stunning set of results, America’s election decided a heck of a lot more than selecting the nation’s next president. It also brought forth a wave of minimum wage increases at the state level that will impact home care businesses and workers. Specifically, four states decided to raise minimum wage rates through ballot measures—Arizona, Colorado, Maine and Washington. The move comes after the nationwide movement for higher wages, dubbed the Fight for $15, has gained significant momentum since its inception nearly four years ago. Since then, roughly 22 million workers have seen raises, with 10 million guaranteed a path to $15 per hour, according to the Fight for $15 organization. Members and advocates of the movement include workers from the fast food industry, airports, child care, home care and more. Home health care and home care companies have already been impacted in states where the minimum wage has been raised to $15 per hour, including California and New York. One California home care provider even had to branch out into other service lines by adding a senior living component to his business after he estimated a 30% drop in business after raising prices due to minimum wage hikes in the state. Other providers have turned to cutting hours and similarly increasing their rates. For home care providers that rely on federal and state payors, increasing wages can’t be offset by raising rates on patients. And reimbursement rates aren’t keeping up with rising labor costs. In Maine, the minimum wage will rise to $9 per hour in 2017, up from the current $7.50 per hour, with escalators in place up to $12 per hour by 2020 and further increases at the same rate of cost of living. Portland, Maine, approved an even higher wage level, which means some agencies have to pay multiple wage rates, depending on which municipality their workers provide services. Rising minimum wage rates in different areas of a state have forced some businesses to raise rates for some services across the board. For example, sick and safe leave benefits, as well as higher wages, were granted in Seattle before the rest of the Washington state. Ballot measures approved on Nov. 8 will increase the minimum wage to $13.50 in Washington state by 2020. The higher wages in one city have pushed prices up across the state so businesses can offset their costs and stay competitive in a tightening labor market. While the election may have illuminated steep partisan lines across the country, some in home care are feeling optimistic about opportunities to work with elected officials. Both the Democratic and Republican parties singled out home care within the national platforms during the campaign season. A home care worker was even a featured speaker at the Democratic National Convention, where she spoke about her advocacy work for a living wage. Fight for $15 has organized a national protest on November 29—the movement’s four-year anniversary— with plans for fast food, airport, child care and home care workers to engage in civil disobedience across the nation. Workers involved are demanding a $15 hourly wage, in addition to union rights. The organization has also highlighted the need for justice for minorities and immigrants in the wake of heightened immigration scrutiny in the aftermath of the election. “In all, tens of thousands from coast to coast will protest Nov. 29 to underscore to the country’s biggest corporations that they must act decisively to raise pay for fast-food, airport, home care, child care and higher education workers, among others, and to let President-elect Donald Trump, members of Congress, governors, state legislators and other elected leaders know that the 64 million Americans paid less than $15/hour are not backing off their demand for $15/hour and union rights,” the group proclaimed when announcing the day of civil disobedience. Association groups, including the National Association for Home Care & Hospice (NAHC), have fought hard against overtime rules and increases to minimum wage around the country. Most notably, the organization took the recent decision by the Department of Labor (DOL) to guarantee minimum wage and overtime protections to home care workers all the way to the Supreme Court. The rule took effect in 2015. Aging seniors and their families are often confounded by the complexity of issues facing the elderly (including declining income, increased debt, poor investment returns, declining health, medical crises, complex insurance programs, long term care challenges, etc…). This book (published in 2014) takes a comprehensive approach to address these challenges and provide solutions. Below is a list of common medical conditions the elderly deal with. These are also conditions that may occur in younger people but some of them such as cataracts, congestive heart failure, chronic obstructive pulmonary disease, osteoporosis, diabetes, stroke, incontinence, dementia, and prostate problems are more unique to an older generation. Remember also that many of these conditions may coexist together in the older person. Older Americans account for over one third of all medical spending in this country — approximately $300 billion a year for their share of the cost. It costs about four times the amount of dollars to treat a 65 year old for health care in a given year than it does to treat a 40 year old. Even though people age 65 and older have their own health care insurance, called Medicare, Medicare simply pays the bills and up to this point has not been actively involved in promoting a better delivery system for this age group. Recently there has been much talk of Medicare supporting preventative, outcome based medicine but aside from a few minor changes little has been done. However, there is a possible change on the horizon. Medicare is currently conducting a test program and evaluating a number of hospitals for their outcome of care with patients. Instead of determining the wellness of patients by treatment protocols or medications the program is trying to identify hospitals that are more successful than others in having positive medical treatment outcomes. The intent is to reward these hospitals with a 20% bonus in Medicare reimbursements. Hospitals that are below average in meeting the standards will receive a 2% reduction in reimbursements. Hospital admissions for the elderly are about three times those for the young. Older Americans visit a health provider at least twice as often as younger Americans. And Americans 75 years and older use hospital emergency rooms about twice as often as any other age group. With a different approach, Medicare could probably reduce older Americans' number of office visits, hospital admissions and emergency room visits. All doctors are certainly aware of the differences in medical problems of the young and of the old. What doctors, who do not regularly treat the elderly, are not usually aware of is the fact that older people often have multiple problems at the same time and symptoms from one may be misleading or mask symptoms from the other. Consider the example above of the lady with low thyroid, malnutrition and depression. Her health care providers failed to test for or even recognize these combinations and the interplay they had on worsening her depression. They even misdiagnosed her depression as age-related dementia. It is not to say that the healthcare profession does not treat the elderly aggressively for medical conditions that are diagnosed. The problem seems to lie with an undue focus on correcting specific problems and ignoring the underlying social, nutritional, psychological and physical activity components of an older person's health. As we have discussed previously, these components have a tremendous influence on the health of senior citizens. This is less true for younger people. Younger people are already active, socially stimulated and pursuing careers. Most healthcare practitioners don't recognize this difference and they treat the older patients only for their conditions assuming they will respond just like their younger patients. Once they have been treated many doctors, especially specialists, go on to taking care of a multitude of other patients and are unlikely to follow up over a long period with their older patients. And those practitioners who do want to provide follow-up are only reimbursed under Medicare if they can find an excuse for an office visit that doesn't include just a routine exam. Most practitioners who specialize in care for the elderly are aware of the above-mentioned problem with older patients and they take a holistic approach with the medical treatment of these people. An attempt is made not only to treat the specific condition or conditions but to make sure there are sufficient activity, proper nutrition and family support at home. They work closely with family members to make sure their loved ones are taking medications properly and are reporting their symptoms. They require those caring for the elderly to closely monitor health conditions and report any changes before things get worse. They meet with their patients regularly enough to monitor their health. This broad-based approach results in better health and in fewer visits to the emergency room because intervention for a worsening condition is achieved at an earlier stage. A good example of this holistic approach is the Veterans Administration health care system. The VA system over the years has become the nation's largest geriatric care provider for older men. Almost all veterans are men and because most veterans hearken back to World War II, the Korean conflict and the Vietnam War most of them are older than age 60. Because of this the VA has found it necessary to adapt its health-care to this age group. The VA schedules regular exams at least every six months or yearly depending on available funds and personnel. A health examination always includes lab work. Screenings for cancer, cardiovascular problems, eye problems, hearing problems and many other conditions common to aging are a routine part of veteran's administration health-care. The VA was one of the first health providers in the nation to require its local hospitals to keep their records on computer and in a central database. This allows health practitioners in the system to quickly and efficiently access all information and avoid misdiagnoses and possible drug interactions. By taking a hands-on, preventative approach to the treatment of older men the system is able to keep its patrons healthier and avoid costly medical interventions due to lack of follow-up. A significant problem with providing holistic treatment is many health insurance providers, including Medicare, will not pay for routine office visits without an underlying medical complaint. Some private health plans are starting to use so-called "pay for performance" or "outcome based care" where the overall health of the patient takes precedence over the procedures used to get there. But Medicare, up to this point, has not made this change. This makes it extremely difficult for the geriatric care provider to monitor his patients and intervene before a health problem becomes bad enough to require hospitalization or major surgery. Doctors practicing this type of medicine have to be inventive in order to provide adequate treatment. Family of the elderly can also help in this respect by "finding" medical complaints to justify setting regular appointments with the doctor. Older Americans have a suicide rate that is four times the national average. Much of this is a result of depression. It is estimated that 20% of the aging population suffers from depression. Practitioners not trained in geriatric care automatically assume that depression is a normal part of the aging process. This is not true. Depression can be treated just as effectively in older people as it is in younger people. But sometimes medications are not as effective in older people as they are in a younger population. Unfortunately, practitioners often rely too heavily on medications and don't try other non-medical therapies. Nursing homes serve two purposes. The first is to provide nursing and medical care for people recovering from illness or injury. The intent is to get these people well and return them back into the community. A second purpose for the nursing home is to care for people who have severe chronic medical or cognitive impairments and who are not expected to recover but only to get worse. These are often called long-term care residents. Rehabilitation patients and long-term care residents are typically segregated in different parts of a nursing home. Or it is often the case a nursing home will specialize only in rehabilitation or long-term care but not both. The general attitude towards long-term care residents is they will never recover and will either die in the nursing home or be transferred to a hospital to die. Some might argue this is reality but it is also age discrimination. As we have seen in previous examples, sometimes long-term care residents are misdiagnosed or given improper medications which may make them candidates for long-term care but they may also respond to treatment and even recovery and as we saw in one example could even return home and lead a normal life. But because of the prevalent attitude towards "warehousing" long-term care residents, most nursing homes do little to try and rehabilitate these people other than treating acute conditions and making them comfortable. Another problem is these people are typically receiving assistance from Medicaid or Medicare. These government programs only pay nursing homes to provide treatment such as dispensing medications, providing assistance with activities of daily living, treating medical conditions or giving psychiatric help. Nursing homes are not reimbursed for alternative therapies that might make patients better. Another problem is often the doctor assigned to the patient either has little interest in providing therapies to facilitate recovery or the doctor is inexperienced in geriatric care. Unfortunately, another reason for not being more actively involved with residents is that many nursing homes in the country have large numbers of unoccupied beds. It is not in their best interest to cure a resident and return him or her to another living arrangement as that would result in a loss of revenue and there are no people standing in line to occupy the vacant bed. This attitude in nursing homes becomes an age discrimination issue. The elderly are treated differently from other age groups. There are a small number of US nursing homes that don't rely on government reimbursement, are not concerned about occupancy rates and are free to use alternative approaches. Some of these facilities have been successful, in a number of cases, in improving the condition of their long-term care residents and allowing them to return to a community living arrangement. They typically use approaches we have already discussed such as involving residents in their own medical decisions, providing pets and plants, providing interaction with children, stressing activity and mental stimulation and in aggressively following up and properly treating medical conditions. This approach is often called "the holistic approach" to nursing home care. American society in general glorifies youth and fears or even despises old age. This is not the case in many other societies where age is associated with wisdom, knowledge and special status. We see evidence of this bias towards older Americans especially in the media. In films and on TV old people are very often depicted as weak, indecisive, bumbling or even comic. We laugh at their misdeeds and forgive their mistakes knowing in the back of our minds that they are old and can't help themselves. We view them not as capable as younger people. It is rarely that we see older people depicted as decisive, strong or as leaders. We see this same attitude with large corporations and government employers. At a certain age, employees are encouraged or expected to "retire" to a new phase of their lives where they are not required to work for a living any longer. Retirement is presumably a reward for many years of dedication and hard work, but the underlying philosophy is more likely based on the idea that older workers are no longer productive or useful. Instead of taking the role as leaders in their families or in the community as is the case in some countries, the elderly in our country, even after successful careers in earlier years, simply become invisible. They waste their prodigious talents traveling, entertaining, socializing, watching TV or playing golf. They are rarely asked to assume responsible roles in the community. And unlike other cultures, older Americans often abandon themselves to control by other people, often their children and their health care providers. Instead of taking responsibility for their own decisions they will rely on children or others to make decisions for them. Many of them seem to enjoy the role of becoming dependent on others. And it is all too often the case that family and others pander to this submissive role of the elderly and we begin treating them like children. This generally accepted perception of aging in our country has resulted in the elderly themselves and in the community at large regarding older people as less valuable than younger people. The assumption is that the elderly have lost the ability to think clearly, to learn new things and they are generally incapable of any physical activity other than walking or sitting. This attitude also carries over into the health treatment that older Americans receive. Many elderly buy into the notion that they themselves are no longer useful and as a result make little attempt to keep themselves healthy and active. After all, they are getting closer to the end of their lives and have no desire to try new things or to challenge themselves or to eat or exercise properly. There is a great deal of anecdotal and research evidence that demonstrates older people can learn, can retain memory and can be actively involved in business and in the community. The lack of physical exercise, social involvement and mental stimulation in older Americans often leads to these people losing the ability to use their minds and their bodies. The older person's negative attitude towards aging becomes self-fulfilling. Many reason that they have missed their opportunities in life when they were younger and it's too late to start over. As a result, many older people are intimidated by new ideas or by technology such as computers, not because they are incapable but simply because of their attitude. The idea of not being able to "teach an old dog new tricks" is in most cases an excuse. Obviously this mindset of failure and inability to perform becomes self-fulfilling. Not surprisingly, depression and suicide are more common in the elderly than in the younger population. The negative attitude towards aging on the part of an older person has a direct impact on that person's health. Many studies show that people who are physically active have less joint pain, lower blood pressure, less depression, fewer heart attacks and a lower incidence of cancer. Proper nutrition also has the same affect on the aging process; it delays the onset of debilitating illness or disability. "…. Research has shown that poor health does not have to be an inevitable consequence of growing older. Death is inevitable, but, for many people, it need not be preceded by a slow, painful, and disability- ridden decline. Our nation will continue to age — that we cannot change — but we can delay and in many cases prevent illness and disability." A study in 2000 from the Journal of the American Geriatric Society reports that inactive women at age 65 have a life expectancy of 12.7 years whereas highly active, non-smoking women at 65 have a life expectancy of 18.4 years. A report from the CDC indicates that very few older Americans get 30 minutes or more exercise for five days a week or more. The report states that up to 34% of adults age 65 to 74 are inactive and up to 44% or almost half of adults age 75 are inactive. A study From the US Preventative Services Task Force reveals that regular exercise can reduce life-threatening falls in the elderly by 58%. Another study showed that regular exercise reduced pain and increased function in joints of older Americans suffering from osteoarthritis. (Reduced the need for pain medications) Yet another study found that strength training was as effective as medication in reducing depressive symptoms in older adults. Other studies from the Department of Health and Human Services support the idea that older people who are responsible for their own health and their own health decisions are healthier than people who rely on others to make decisions for them. Lack of activity and poor nutrition often lead to obesity. More than any other problem facing older people, obesity can have the worst effect on their health. It leads to joint degeneration, heart problems, stroke, congestive heart failure, diabetes and a whole raft of other chronic medical conditions. And obesity among all ages is becoming a national crisis. Another health problem with the elderly is the overuse of alcohol, cigarettes and addictive medicines such as pain killers or tranquilizers. It is assumed by the elderly and by their family that long-term use of these substances has gotten to a point where it would be pointless or impossible to get the elder person to discontinue or cut back on their use. In other words older people are no longer useful so let them have their bad ways. "Everyone dies at some point; what does it matter what causes the death." For instance it is assumed that smoking has already done its damage and little could be achieved in stopping. Actually recent evidence indicates that no matter what the age, cessation of smoking can reduce the incidence of chronic lung disorders and improve lung function even after a few weeks. "Let them have their vices, it gives them comfort and relief from pain and they are old and are going to die anyway". Because of this public attitude many elderly people waste the remainder of their lives living in alcohol or drug induced stupor. And their health suffers as well due to lack of activity and poor nutrition. The average 75-year-old suffers from at least three chronic medical conditions and takes five or more medications. Oftentimes older people have resigned themselves to a life of suffering and pain. They are not particularly interested in changing or improving their medical condition but are simply waiting out the rest of their life. These people often exhibit a phenomenon known as "the reluctant patient". They will not listen to medical advice, they have little interest in their own health and they often don't take their medications properly or they overdose. Doctors and other health professionals treating reluctant patients don't get the information they need in terms of symptoms or progression of treatment. The patient will typically lie about his or her condition. It requires a greater understanding from medical professionals and encouragement or sometimes forceful intervention from family to help the reluctant patient understand his or her attitude and participate in his or her medical treatment. The result can often be improved health and a greater quality of life. Families or others involved with an elderly person must recognize the all too common attitude of worthlessness, defeat and resignation from elderly loved ones and take corrective action. They should encourage and possibly even prod the older person to be stimulated mentally, socially and physically — to be actively involved; to give him or her a purpose for living. But families should also be very careful not to become patronizing or controlling but be genuinely supportive in this process. Here are some ideas. Make sure an elderly loved one has challenging activities throughout the day instead of simply watching TV or viewing videos. This might include trips to interesting places, visiting senior centers, providing challenging games or puzzles, doing volunteer work, providing an opportunity to be involved in church work, offering stimulating conversation or working on an adult education class or college degree. If the person is interested, encourage him or her to become involved in handcraft, genealogies, creative design, writing, scrap booking or other challenging home oriented activities. Give them responsibility for taking care of pets such as a dog, a cat or a friendly bird. In addition, if feasible, allow them to care for plants as well. This strategy is used often in nursing homes to reduce depression in the elderly and to actually improve their health as well. It really works. If a caregiver for an older person cannot be present, make arrangements to enroll a loved one in adult day care. These providers often offer the same strategies we are talking about here. Provide opportunities for family and friends to come by and visit and encourage or even arrange such encounters. Provide opportunities for the older person to interact, teach and nurture children such as grandchildren or children in a day care center. This is an extremely effective strategy for helping the older person feel that he or she has a meaningful existence. And it has a dramatic impact on improving and maintaining health. Design or arrange an exercise program and come up with a way to encourage the older person to follow it. Understand the nutrition needs of an older loved one, especially the need for vitamins and minerals including iron. Get some books on the subject or go to the Internet. Make sure the person takes care of him or herself and eats properly. Fixing special meals, providing treats, getting takeout or going out to dinner can be fun and exciting for anyone regardless of age. Many elderly people neglect their own nutrition. Poor nutrition can cause all kinds of mental and physical problems in the elderly. Make sure an older person has opportunity to look good and have nice clothing. Make sure the person gets out in public, and tries dining out or going to a public event and can feel good about his or her appearance. • Healthcare professionals do not receive enough training in geriatrics to properly care for many older patients. • Older patients are less likely than younger people to receive preventive care. • Older patients are less likely to be tested or screened for diseases and other health problems. • Proven medical interventions for older patients are often ignored, leading to inappropriate or incomplete treatment. • Older people are consistently excluded from clinical trials, even though they are the largest users of approved drugs." A 90 year old man meets with his doctor and complains about pain in his right knee. The doctor tells him, "Well Henry, what do you expect? You're 90 years old." Henry replies, "But doctor my left knee is the same age as my right knee, there's no pain and it feels just fine!" Many in the health-care profession consider old age to be a disease itself. Any medical problems are inappropriately attributed to old age as if it were a medical condition. And since there is no cure for old age, appropriate tests and treatment are never performed. Thus, medical problems that may not be related to age and may just as frequently occur in younger people are often not treated. As an example a recent survey of physicians involved in the health-care of the elderly reported that 35% of the doctors considered hypertension a result of the aging process and that 25% of them felt that treating an 85-year-old for symptoms of hypertension would cause more harm than the benefits it would produce. A 71 year old woman has surgery on her shoulder for a bone spur that is causing her considerable pain. The surgery is successful and she goes through several months of physical therapy to help her recover. But she is not recovering as expected. She continues to experience pain that radiates through her entire back. Her physical therapist does not know how to help her and attributes her failure to recover to old age. She visits her family care doctor at least twice over the next six months complaining of extreme tiredness and lack of energy. Her skin color is gray and she does not look healthy. Finally she visits her doctor and insists he check her for some problem since she is not recovering from the surgery and she feels awful. After her insistence he does a CBC blood lab and discovers she is severely anemic. He puts her in outpatient care and gives her four units of red blood cells and puts her on iron supplementation. Within two weeks the pain has disappeared and within a month she has recovered fully from the surgery. Numerous tests are done but there is no explanation for the anemia. Six months later she is healthy and active and her cheeks are ruddy. When she asks her doctor why he did not suspect anemia he tells her that she has never had anemia and based on her history he would never expect her to develop it. (He obviously has no training in geriatric care.) He then tells her, in an obvious contradiction of his previous position, that older people sometimes fail to absorb iron. Ironically, she defends the action of her doctor and does not feel he acted inappropriately. Susan and John have been married for 46 years. Susan has always demonstrated a tendency for depression but it has generally been kept under control with medication. John's health begins to deteriorate and within a year he is dead. Several months after her husband's death, Susan is exhibiting signs of severe depression. She is given ever-increasing levels of various antidepressants but they have no effect. She is also exhibiting signs of a psychosis and is inflicting wounds upon herself. The family puts her in an assisted-living facility but they are unable to deal with their aberrant behavior. Her son who lives in New York decides to bring her to live with him and he admits her to a hospital in New York City . Tests indicate she is suffering from severe hypothyroidism and she is put on appropriate treatment. (Apparently no health practitioner had to this point suspected there may be another condition contributing to the depression other than old age.) The low thyroid undoubtedly was a significant factor in the development of her depression. But treatment of the depression is not addressed in the hospital and it has progressed considerably. She is transferred to a nursing home and wrongly diagnosed with dementia and placed in the dementia unit. She is deteriorating rapidly, she continues to abuse herself and she refuses to speak or acknowledge anyone. Within a few months she will probably be dead. At this point an experienced geriatric care physician steps forward and correctly diagnoses her condition as clinical depression. She is hospitalized for six months and undergoes aggressive treatment for depression. They also discover she is severely malnourished and correct that problem as well. She has now moved back into the home of her son. She is a normal functioning person and is even volunteering to work in the local library. The elderly health care system almost dropped the ball on this one. A 65 year old woman, who has been active all of her life, has a small stroke which leaves her with some discomfort and pain in her right arm but does not limit her in any other way. She is anxious and nervous about her condition and the possibility of another stroke and the doctor prescribes pain pills and Valium to help her with her anxiety. Over a period of 15 years, she becomes addicted to Valium and does little else except sit in front of the TV all day long. She makes sure she maintains contact with a doctor who will provide her need for Valium. (No doctor or pharmacist would allow this abuse to go on with a younger person without intervention. Older people are often ignored and allowed their vices.) Early on, her family can see the problem and they decide to intercede. On the advice of friends they contact the geriatric care unit at a local university hospital. A geriatric care physician is alarmed at her addiction and insists they wean her off of the mood altering drug. He is willing to treat her and help her. She refuses to cooperate and in deference the family backs off. Over a period of 15 years she gets no exercise except for trips to the bathroom or trips to the living room to visit occasionally with her family. But family and grandchildren over the years visit less and less often. After many years of sitting in the same position her knees deteriorate and she finds it difficult to walk. In order to avoid getting up from her chair to walk to the bathroom, she drinks very little fluid and becomes chronically dehydrated. This does not help her mental or physical condition. She has the joints in both knees replaced but does no exercise and the combination of the invasion of muscle tissue and lack of use of her legs causes muscles around her knees to atrophy. No follow-up is done by the orthopedic surgeon to make sure she remains active, after all she is old. She can now barely walk at all. She spends her final three years confined to one room in her daughter's house, refusing the use of a wheelchair and refusing to go anywhere beyond the bathroom. In this case a general lack of concern by all involved demonstrates the apathy of family and the healthcare community to making sure elderly people can experience a meaningful existence in their remaining years. Had this been a younger person, say in her 40's, everyone involved would have been more aggressive in helping her solve her addiction and in making sure she had a better quality of life. What Should You Expect At Your Age? A Lot! Dr. Rob Stall is passionate about the area of geriatric health care. He is a board certified geriatrician and maintains a private practice as well as being medical director for a number of health care facilities. In addition to his practice, Dr Stall has a popular monthly radio program and he speaks frequently to local groups about care for the aged. Hospital admissions have always been a major concern for the aging population, but the sheer numbers will make a rising problem even worse without alternatives to help take pressure away from hospitals. With an influx of senior patients using emergency health care services, some health systems are exploring the ways in which they can improve the experience for seniors, specifically, and they’re also looking closely at care provided in the home before and after ER visits to help cut down on senior ER admissions and readmissions. The University of California, San Diego, which operates multiple hospital campuses in greater San Diego, through grant funding of $12 million from San Diego-based West Health, is under way with plans to build a senior-specfic emergency room. It also has piloted a project to provide acute care at home. The care at home project is not restricted by age, but 90% of the patients are over age 65. In the period of time 24 to 72 hours after a hospital admission, nurses provide care in the home such as blood draws, intravenous antibiotics administration and other medical services. An additional layer involves encrypted text messaging between the nurse and the physician who assumes the care at home and can intervene if needed. The acute care at home project is one avenue UCSD is pursuing to improve the care process for seniors and all patients while taking some pressure away from emergency rooms. A senior-specific ER is also being designed with a similar goal in mind. The $14 million, 8,500-square-foot project anticipates completion in 2018. Current emergency medical facilities do not have the capacity to serve the wave of senior patients that is coming via the “silver tsunami,” said Dr. Ted Chan, chair of the Department of Emergency Medicine at UC San Diego. There are currently around 100 emergency rooms nationwide that market themselves as geriatric ERs, Chan said, although few are taking such a comprehensive approach as UCSD’s. The university is collaborating in its research with a couple of figureheads when it comes to geriatric ERs, including Northwestern Memorial Hospital in Chicago and Mt. Sinai Hospital in New York City. The approach to developing a senior-specific ER involves both research and data analysis, said Dr. Zia Agha chief medical officer for West Health, on the same panel. In very loose terms, a geriatric ER is one that has specific accommodations for senior patients. This could mean materials used for flooring that can help prevent falls, for example. The UCSD project, which will break ground in 2017, is also looking at a number of other elements: ample windows for natural light; ambient light that will prevent patients from becoming disoriented; acoustics and sound absorption to help patients who are hard of hearing; considerations for mobility issues including fall prevention; and ample space for caregivers in the ER, since in many cases the caregiver accompanies the patient. But in addition to the physical aspects of the ER, training of medical staff is a major consideration. UCSD and West Health are exploring the approach of staff, including care processes and transitions. All nursing staff will be trained on this screening, as well as in care transitions. Post-discharge planning and communication is yet another prong of the research where opportunities lie, Chan says of an acute care at home project aimed at reducing hospital readmissions. “If we can get [patients] home or to assisted living, but we’re not able to make it to their home, there’s [some service we can provide] from the ED that may result in some significant costs saving,” he said. That might include nurse visits within the first 72 hours post-discharge to perform IV antibiotic administration or blood draws as in the acute care at home program. And as construction gets under way, the researchers and partner institutions will learn more about what works in the senior ER, in hopes to help address a rising issue before it becomes a problem. The myths and stigmas that surround these conversations are why many people are hesitant to even bring up the idea, so debunking them is the first step in opening a dialogue, according to HomeAdvisor’s Aging in Place Report 2016. As a major push for higher minimum wages has swept the country, a new report underscores that boosting wages to $15 per hour specifically for home care workers might help strengthen the economy. In Washington state, 34,686 state home care workers are paid through the Medicaid program and represented by the Service Employees International Union 775; increasing their minimum wage to $15 per hour would affect 81% of the state’s individual provider workforce, according to a report from The Washington State Budget & Policy Center, an organization that seeks to shape state budget decisions and discussions. Currently, hourly wages for Washington-employed home care workers don’t cover all their basic needs, according to the report. The average hourly worker in the state—78% of which are women—earns $12.82, for an average annual income of $10,540. A bump to $15 per hour would provide an additional $63 million in earnings for home care workers. If a state law increased minimum wage to that $15 mark for Medicaid-employed workers, private pay workers would see their wages matched, according to a Washington law. Increased wages would spur more economic activity, with a “significant increase in the purchasing power” of the affected workers, according to the report authors. The $90 million in increased wages between public and private home care workers could result in at least $180 million in total annual economic stimulus, the report says. Additionally, it could result in more than 800 private employment job opportunities. While workers may benefit, patients and businesses could suffer as a result of higher wage pressures. One home health care company, which does not rely on Medicaid-reimbursed services, had to raise its prices so much as a result of higher wage costs, it lost an estimated 30% to 40% of its business. That business owner sought to create a new business line to make up the lost business by branching into senior living. Last time we discussed internal factors that can increase fall risk. We wanted reinforce the importance of addressing this issue and examine external factors that can be changed to decrease fall risk. The statistics are alarming. Seventy-eight percent of all broken bones in the elderly population are due to falls. A third of the elderly population falls at least once a year. Fifty percent of the elderly that fall and are hospitalized, never return home to independent living. "A third of the elderly population falls at least once a year." 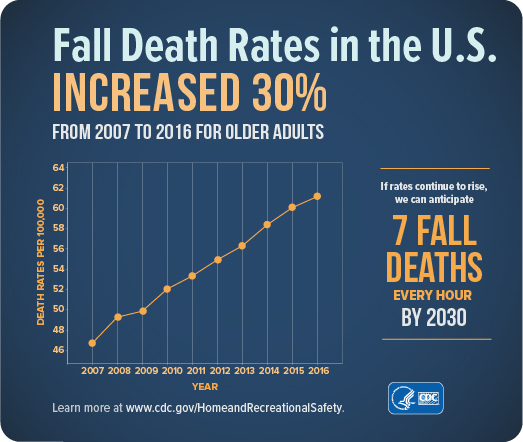 Each year, 2.8 million older people are treated in emergency departments for fall injuries. Adjusted for inflation, the direct medical costs for fall injuries are $31 billion annually. Hospital costs account for two-thirds of the total. no handrails along stairs or in the bathroom. Taking inflation into account, American home care workers are actually making lesser wages than they did 10 years ago—despite their jobs being in greater demand than ever before. In fact, given the enormity of the upcoming demand for home care workers, this trend is unsustainable, according to a new research report. There are about 2.2 million home care workers in the United States, and about 1 in 4 of them live below the federal poverty line, according to recently published research from the Paraprofessional Healthcare Institute (PHI). PHI is organization based in Bronx, New York, that works with care providers, consumers, policymakers and labor advocates to strengthen direct-care jobs. Home care worker wages have not kept pace with inflation over the last 10 years, PHI’s research shows. In fact, inflation-adjusted wages stayed basically the same, and actually fell from $10.21 in 2005 to $10.11 in 2015. Additionally, about two-thirds of home care workers work part time or for part of the year. Their employment tends to be erratic, as client care needs range from a few hours per week to around the clock, and may change with time. Due to inconsistent hours and low wages, home care workers bring in a median annual income of $13,300. More than 50% of all home care workers depend on some kind of public assistance, the research reveals. All of these factors combined do not make home care a necessarily attractive field for workers. But with the number of Americans over age 85 expected to triple to 19 million by 2050, the home care industry will have no choice but to attract new workers, PHI notes. Between 2014 and 2024, home care occupations—home health aides, personal care aides and nursing assistants—are expected to add more jobs than any other single occupation, with an additional 633,100 new jobs, the research report shows. “If the home care workforce is to grow, jobs will need to be more competitive, offering higher wages and improved working conditions,” PHI’s report concludes. Rising minimum wage levels have come to the forefront of American politics this year, with the Fight for $15 per hour taking center stage across numerous industries. Home care workers are one of those industries where on-the-ground activism has led to a big payoff—but only in some areas of the country. For the vast majority of Americans working minimum and low-wage jobs, not much has changed. It’s a topic I report on often, but I haven’t had the opportunity to see what home care wages really look like, until I recently viewed a documentary focusing on the home care workers’ perspective. As home care workers continue to band together to push for higher wages, a recently released documentary portrays the lives and hardships of caregivers who take care of seniors at home. The filmmakers underscore the dignity of home health care, while strongly making a point that home care workers deserve a living wage and that families should not go bankrupt to provide care to a loved one. In a word, I found the documentary heartbreaking. From the need to provide dignity and care for older Americans to the hardships faced by low-wage workers, the film attempts to expose some of the vulnerable points of the home care industry. The documentary, Care, was funded by several groups, including ITVS, The MacArthur Foundation, The Ford Foundation and Chicken & Egg Pictures to take a deep dive into the caregiving world. “From the time we are born, we start aging,” Ai-Jen Poo, author of Age of Dignity, co-director of Caring Across Generations and director of National Domestic Workers Alliance, says in the film. Poo advocates for better conditions and workforce protections for home care workers, emphasizing that just about everyone will need care when they are older. The average home care worker makes an average of $13,000 per year, an unsustainable salary for everyday living, Poo said. Poo was also an advisor on the film. The film was directed by Diedre Fishel and produced by Tony Heriza, who regularly engages in media for social change. While both consumers of home care and home health aides faced struggles related to finances, the film did offer some hope by skewing a pro-union stance from the workers’ perspective. Many home care workers depicted in the film were involved in local unions and advocacy groups working for higher wages. As a reporter who covers home health industry news with an audience made up mostly of providers and employers, I found myself much more emotional when viewing wage issues from the worker perspective. Though, the film does not give much credit to industry employers that face similar challenges related to rising wage pressures. Shifting between four home settings, the documentary centers on the lives of home health caregivers and those with serious chronic illnesse sreceiving care in New York and Pennsylvania. As the number of U.S. seniors continues to swell over the next decade or so, home caregivers are going to become all the more important. And yet, the fast growing workforce in the country faces some of the harshest realities and the industry could soon be facing a shortage of these much-needed caregivers. “The fact that the fastest growing workforce earns poverty wages … is a huge problem,” Poo said in the film. Laurie, a caregiver in McClure, Pennsylvania, said she made just over $300 per week as a caregiver to Larry, who suffered from COPD and emphysema. She doesn’t make enough to pay her rent without the help of her fiancé. “I feel we are underpaid because … I am not thought of as a caregiver, because I’m in a home,” she said. After taking care of Larry full time until he passed away, Laurie was unable to find a new permanent position with her home care agency, and eventually ended up working for the state of Pennsylvania doing work for roadways. Home care workers are not entitled to unemployment benefits when their patients die. While she made $5 more per hour and was entitled to full employee benefits, Laurie explained how she found the work less fulfilling and missed being a caregiver. The effect of low wages for home care workers has the potential to upset the huge and growing demand for these workers. The best caregivers may be unwilling to stay in the profession due to the low wages, instead moving into other industries, even fast food. “If we invest in this workforce…. they can be a huge part of the solution, managing chronic illnesses,” Poo said on a radio show, The Brian Lehrer Show, on New York’s outlet WNYC. Around-the-clock home care for New York resident Peter decimated the family resources before the family qualified for Medicaid. However, once being on Medicaid, Peter’s wife Toni faced a new challenge in finding quality caregivers willing to stick around. Over the span of 12 months, Toni spent more on home care than she had made in the past four years, she said. Although the family was initially excited to get onto Medicaid, which would help pay for the services, they soon realized few nurses wanted to work for the low wages. “We finally got onto Medicaid, and I thought it was fabulous news until we started using it,” Toni said in the film. The struggle highlighted how little home care workers make and why few want to work for wages largely provided through Medicaid reimbursement. Vilma, an undocumented home care worker who worked with 92-year old Dee, was approved for her green card during the filming of the documentary. Vilma originally started work in the U.S. cleaning homes, but moved into the high-demand industry of home care. Vilma was a strong advocate for the work she does and fighting for better wage conditions for the home care workforce. “Every elder person has the right to have the real attention, the real care,” she said of home care. Over all, I think the film depicts a very personal reality for many home care workers in the country. Though, many aspects of current wage laws are changing, for both employers and employees. While individual companies may struggle as wages continue to rise, the message is clear: the struggle exists on both sides. Home health care helps older adults live independently for as long as possible, even with an illness or injury. It covers a wide range of services and can often delay the need for long-term nursing home care. Home health care may include occupational and physical therapy, speech therapy, and skilled nursing. It may involve helping older adults with activities of daily living, such as bathing, dressing, and eating. It can also include assistance with cooking, cleaning, other housekeeping, and monitoring one’s medication regimen. It is important to understand the difference between home health care and home care services. Although home health care may include some home care services, it is medical in nature. Home care services include chores and housecleaning, whereas home health care usually involves helping someone to recover from an illness or injury. Home health care professionals are often licensed practical nurses, therapists, or home health aides. Most of them work for home health agencies, hospitals, or public health departments licensed by the state. Healthcare Resources Home Health provides the most comprehensive health care, including: Skilled Nursing, Physical Therapy, Occupational Therapy, Speech Therapy, Medical Social Services, and Home Health Aides to our patients. Our Specialty Programs Include: Diabetic Management, PT/INR Home Testing, Cardiac and Pulmonary Rehabilitation, High Tech Wound Care, Extensive Patient and Family Education, Bowel/Bladder Training and Maintenance, Orthopedic Rehabilitation, and a Home Exercise Program. We are also on-call 24/7 for our patients. We do not have an answering service so if a patients calls any time of day or night an RN ansswers the phone to take their call. As with any important purchase, it is wise to talk with friends, neighbors, and your local Area Agency on Aging (AAA) to learn more about the home health care agencies in your community. Consider using the following questions to guide your search. How long has the agency served this community? Does the agency have a brochure describing services and costs? If so, take or download it. Does a national accrediting body, such as the Joint Commission for the Accreditation of Healthcare Organizations, certify the quality of care? Does the agency have a current license to practice (if required by the state)? Does the agency offer a “Bill of Rights” that describes the rights and responsibilities of both the agency and the person receiving care? Does the agency prepare a care plan for the patient (with input from the patient, his or her doctor, and family members)? Will the agency update the plan as necessary? Whom does the agency call if the home health care worker cannot come when scheduled? What is the procedure for resolving problems, if they occur? Whom can I call with questions or complaints? Whether you arrange for home health care through an agency or hire an independent aide, it helps to spend time preparing the person who will provide care. Ideally, you will spend a day with the caregiver, before the job formally begins, to discuss what is involved in the daily routine. At a minimum, inform the caregiver (verbally and in writing) of the following things that he or she should know. Need for dentures, eyeglasses, canes, walkers, hearing aids, etc. Although most states require home health care agencies to perform criminal background checks on their workers and carefully screen applicants, actual regulations will vary depending on where you live. Therefore, before contacting a home health care agency, you may want to call your local area agency on aging or department of public health to learn what laws apply in your state. Please call us for more information at (817) 633-2273. Durable medical equipment. Medicare pays 80 percent of its approved amountfor certain pieces of medical equipment, such as a wheelchair or walker. You pay 20 percent coinsurance (plus up to 15 percent more if your home health agency does not accept “assignment”—accept the Medicare-approved amountfor a service as payment in full). *If you only need occupational therapy, you will not qualify for the Medicare home health benefit. However, if you qualify for Medicare coverage of home health careon another basis, you can also get occupational therapy. When your other needs for Medicare home health end, you should still be able to get occupational therapy under the Medicare home health benefit if you still need it. Healthcare Resource’s Home Health mission is to provide a wide range of professional, high quality health care services designed to optimize every patient’s dignity, autonomy,and comfort. We are advocates for the patient and strive to assist patients in gaining quality of life during their time of need. We are dedicated to continually seeking new ways of being responsive to the ever-changing health needs of our patients and the communities we serve. Home health aides fill a specific and very important role in a home care plan. Certified home health aides receive training to assist with activities of daily living. They provide companionship and deliver personal care, such as help with bathing or dressing. They also can help with meal preparation and feeding, and assist you with errands or getting safely to and from appointments. A home health aide can help keep track of your symptoms and will be alert to any changes that require medical attention. However, home health aides cannot provide medical or skilled nursing care. For example, a home health aide can remind you to take your medications on schedule and record vital signs, but they cannot dispense medications or, except under specific circumstances, check vital signs. Your aide may assist with light housekeeping that is related to care (such as cleaning up the kitchen after feeding your loved one or tidying the bathroom after bathing and dressing), but it’s important to remember that a home health aide is not a housekeeper. Your aide’s primary responsibility is to see to your or your loved one’s well-being. When you hire a home health aide, you should expect a person who is compassionate, trustworthy, and knowledgeable. And for peace of mind, it’s important to hire an aide who is insured, certified, and properly trained. When you’re sick, the last thing you want to do is check references or verify insurance or training credentials. Hiring an aide from a certified, licensed home care agency relieves this burden. An agency should make sure that its aides are properly trained and credentialed, that its aides have passed comprehensive background checks, and it should have the depth of staff to match you with an aide who meets your needs. Training. A properly trained home health aide is more likely to notice changes in behavior or symptoms and act immediately and appropriately. In New York State, home health aides are trained and certified by a program approved by the New York State Department of Health. This program requires 79 hours of instruction in assistance with activities of daily living. Compatibility. An agency is able to assess each aide’s strengths, abilities, and interests. When you call an agency, a client services representative will ask you a series of questions to understand the physical, emotional, and mental needs of the person who needs care. This will help to match you with an aide who has the skills you need, shares your interests, and is familiar with your culture, background, and even the language you’re most comfortable speaking. Healthcare Resources provides a broad range of comprehensive services to clients who are in need of acute rehabilitation, skilled nursing, personal care assistance and/or Medical Social Services. Home Health Services aid the clients in achieving and sustaining the highest quality of health, activity, and independence in their own home. Services are provided by experienced, trained professionals under the direction of the physician. An individualized plan of care is established for each client to provide the best combination of services required for continuity of care. Please call us at (817) 633-2273 for more information. Changes in your loved one's condition may mean home health care is needed. Please call Healthcare Resources Home Health at (817) 633-2273 for more information on home health services. If you went home to visit family over the holidays, you may have noticed a change in your parents’ mental or physical condition. Perhaps your mother is more forgetful, or maybe your dad’s balance has deteriorated. You might not be sure if your loved one needs help, but you suspect that something isn’t right. How can you tell whether the changes are simply a part of aging or if they’re a sign of something more serious. Caring for a family member or loved one with healthcare issues is often overwhelming and challenging for all involved. It can sometimes be difficult to make decisions and find the answers regarding healthcare decisions. Many times you do not know where to turn for these answers and support. When you haven't seen a loved one for a while, or even if you have, changes are scary. People are often fearful and want basic information. It's important to listen to the situation, and then try to explore every aspect. The first step, is to determine if your parent needs medical care. The first step of a home health care company, is to go through the services offered and try to determine whether a parent needs custodial care or if there’s a need for skilled care. If there’s a medical need, we encourage callers to contact their parent’s doctor as well. Has your family member been diagnosed with any of these conditions? Have they experienced any of the following in the past three months? Does your family member have difficulty keeping track of which medications they are supposed to be taking, or have they accidentally taken the wrong medication or wrong dose of medication? Does your family member have difficulty performing any of the following activities? Is your family member dependent on a caregiver to take him/her to doctor appointments? Has the frequency of your family member’s physician visits increased or the number of times that they call the physician to deal with symptoms of their condition or side effects of their medication? Is your family member on medication that makes it unsafe for him/her to leave home? Is your family member’s medication changing? Is your family member in need of physical therapy, speech therapy or occupational therapy? Healthcare Resources Home Health has skilled staff available 24/7, to assist you and your family member/loved one in providing quality individualized care to you as we work toward your goals of recovering from your illness or injury while allowing you to remain at home. Individual who has health problems, but who wants to maintain their independence in their home with the support of a skilled clinician. Patient who has been diagnosed with a new illness or has had a change in health status requiring changes in medication, care or treatment. Patient who is recovering from an injury, accident or has experienced frequent falls and is in need of therapy services to help them achieve maximum functional level. Patient who has returned home after being hospitalized for an illness and is in need of care, treatment and/or monitoring by a skilled clinician. Patient who has complex treatments that require use of medical equipment and/or medication monitoring. Patient who has a chronic disease and/or disability such as Alzheimer's, COPD, heart failure, kidney disease or diabetes that requires close clinical monitoring but does not want or need to enter a nursing home or skilled care facility. Healthcare Resources Home Health is RN owned and operated with 25 years of home care experience. We practice stringent hiring processes to employ the most experienced, qualified and skilled staff available for the highest quality of patient care. Please call us at (817) 633-2273 for more information on home health services. Muscular strength is a muscle's ability to generate force. The purpose of strength training is to increase muscle and connective tissue size, density, and toughness. Bigger muscles and stronger connective tissues are less likely to be injured. Strength training will also improve function – or the ability to get out of a chair, climb stairs, walk, and maintain balance. There are many myths associated with strengthening exercise and unfortunately, they may discourage you from participating in activities that can improve your quality of life. Myth 1 – seniors cannot improve their strength. Wrong! It is completely possible for older people to double or triple their strength in 3-4 months. Can you imagine what you could do if you were twice as strong as you are now? Myth 2 – seniors should not do any strength training. Wrong! Seniors need strength training more than any other age group. As you age you lose strength, muscle mass, and function. The great news is that you can recover much of it. You can also improve your strength in as little as two weeks. Myth 3 – seniors should only participate in low intensity exercise. Wrong again. There are good studies that demonstrate that exercises at higher intensities are safe and more effective. The key is that the resistance must be enough to challenge your muscles. Myth 4 – seniors with health problems should not participate in strength training. You guessed it – wrong again! Resistance training is appropriate for seniors with many health problems and in some cases, may be preferred over aerobic exercise. It is important to consult your physician and physical therapist. I hope you are convinced that you can and should participate in a strength training program. It is almost a sure thing that you will improve your quality of life. To avoid injury, individualized instruction is necessary. You must use the appropriate resistance and good form to maximize benefits and avoid injury during strength training. Please consult your physical therapist for more information at Healthcare Resources Home Health at (817) 633-2273. What’s home health care & what should I expect? Please call us for more information on home health care services at (817) 633-2273. The following list of services is available to home health patients. If any of your patients have one or more of the following needs, please consider them for home health with Healthcare Resources Home Health located in the Dallas Fort Worth area. Healthcare Resources Home Health is RN owned and operated with 25 years of home care experience. We practice stringent hiring processes to employ the most experienced, qualified and skilled staff available for the highest quality of patient care. Call us for more information at (817) 633-2273. Skilled Observation and Assessment would be considered reasonable and necessary when a “reasonable probability exists that significant changes in the beneficiary’s medical condition may occur”. The SN would be required to evaluate the need for modification of the treatment plan, medication changes, the need for medical intervention, hospitalization etc. Management and Evaluation of a care plan would be reasonable and necessary where underlying conditions or complications require that only a RN or PT can ensure that essential non-skilled care is achieving its purpose. The complexity of the unskilled services that are a necessary part of the medical treatment must require the involvement of a RN to promote recovery and medical safety. Teaching and training activities which require the skills of a nurse to perform for the treatment of the patient’s acute medical condition or injury. Coverage for teaching is NOT dependent on what is being taught. The teaching itself is considered the skill and is covered by Medicare. Teaching would include, treatments, diagnosis, medications, safety in the home, safety when leaving the home, Emergency preparedness, self-care activities, bathing, preparing meals, diet’s, how to shop to be compliant with diet restrictions, HEP (home exercise programs), ROM exercises, instructions to a caregiver to assist with patient care such as transfers, ambulation, skin care, bathing, infection control, fall prevention, medications and side effects, catheter/ostomy care, wound care and any other topic as it relates to the patient’s medical needs. Pre-Post op surgical intervention including pre-op teaching and home safety evaluation, DME needs and/or evaluation of post-op needs. Post-op care, wound care, staple/suture removal, infection control, liaison between surgeon, patient/family/caregivers during the recovery process. Therapy if indicated. Medication administration not routinely administered by a lay person such as eye drops or topical ointments. Diabetic Care including insulin preparation, teaching the patient/caregiver how to administer insulin, use of glucometer, food selections, foot care, skin care etc. Venipunctures are not considered a stand-alone skill but can be done during a regular visit for one of the skills listed on this document. Wound care (other than Stage I) that requires hands-on treatments and/or skilled observation of the wound(s). Home Health Aide services are not considered billable under Medicare, however an aide can be provided as long as the patient has at least 1 qualifying skill listed above. Many patients benefit from home health services for varous reasons. We appreciate you thinking of us when you have a potential patient. Healthcare Resources Home Health provides the most comprehensive health care to bridge the gap between hospitals, rehab centers, physicians and the patients own home. Our office is on call 24/7, which means that when a patient calls in at any time of day, they will receive an RN and not get an answering service. We service residents in Tarrant, Dallas, and Johnson counties. Texas Senior Corps is the leading senior volunteer service partnership for solving community problems, strengthening communities, and building the capacity of nonprofit organizations in Texas. Through the component programs of Senior Corps – RSVP, Foster Grandparents, and Senior Companions – more than 22,000 Texans age 55 and older utilize their experience, skills, and talents to assist local nonprofits, public agencies, and faith-based organizations in carrying out their missions. Over 20,000 RSVP volunteers currently serve through 28 projects in Texas supporting independent living for seniors, tutoring and mentoring of youth, disaster preparedness for communities, food security for individuals and families, and much more. Over 1,500 Foster Grandparents currently serve through 17 projects in Texas supporting children and youth with special needs by providing one-on-one tutoring and mentoring. Nearly 900 Senior Companions currently serve through 10 projects in Texas, helping homebound seniors and other adults maintain independence in their own homes. The 55 Senior Corps projects in Texas offer nearly unlimited opportunities for volunteers to apply their lifetimes of experience to make a difference in their local communities. Contact us today to learn more about how experienced Texans can become involved in making a positive and lasting impact in their communities. For Tarrant County- Tarrant County Senior Corps Program is who Seniors would speak to about volunteer work. Please call (817) 632-6022 for more information. Healthcare Resources Home Health introduces Echelon Place, a new Assisted Living and Home Care facility in Mansfield, located at 140 North Mitchell Road. For more information on Echelon Place, please visit their Ribbon Cutting coming up. Healthcare Resources Home Health will also be there to answer any of your Home Health questions. Isle at Watercrest is pleased to partner with Envoy Hospice to provide The Virtual Dementia Tour. This hands on experience is for anyone seeking to understand the physical and mental challenges of those with Alzheimer's or dementia. This unique program gives us a glimpse into the world of those with memory loss disorders. The goal of the program is to raise awareness and heighten the level of sensitivity for caring with those with dementia. *There will be supervised care provided in a secured area for persons with dementia so caregivers can participate. When the time arrives to seek outside home health care for your loved one, emotions and uncertainties can prevail. Thankfully, there are reputable sources of information and services available. People often receive home services following a hospitalization or care in other care settings. Usually the hospital discharge planner or social worker provides information on area agencies. Ask the hospital for a list of home health care agencies in your community. Physicians, friends, and family can recommend agencies, as well. Make every effort to acquire at least two references from the hospital or other sources. Also consider personal references for private caregivers or companions. To help them select the right home health provider, the National Association for Home Care suggests asking the following questions about the agency, associated expenses and the individual professional. Is the agency licensed and bonded by the appropriate authority? Can the agency provide references? Ask for a list of doctors, hospital discharge planners and former clients who have experience with the agency. How does the agency protect client confidentiality? Is the agency inspected by any outside organization? Ask for the results of the last inspection. Does the agency perform a customer satisfaction survey? Request the results of the most recent survey. Can the agency provide written information about the services they provide? Can the agency provide written information about the rights and responsibilities of the providers, patients and caregivers? How does the agency select and train care providers? What are the credentials of the caregivers who work for the agency? Does the agency perform criminal background checks or drug testing? Do caregivers work directly for the agency? How are they supervised? Do they consult the patient's physicians and family members? Is the patient's course of treatment documented in a care plan, detailing the specific tasks to be carried out by each caregiver? How are the family, patient and aide educated about the care to be provided? Are nurses or therapists required to evaluate the patient's needs as they change? If so, what does this entail? Will proper care be scheduled at any time of the day or night that my physician says is necessary? Will the same caregiver be sent to my home for each visit? Whom should I call with questions or complaints? How will the agency respond? Can the agency provide me with written information about the services available? Is there a written plan of care for each patient? Does the agency involve the patient and caregivers in designing this plan and educate them about the care provided? How does the agency respond to emergencies? How long is the response time? Will the agency help me find other community services such as Meals on Wheels or homemakers services — or help find medical equipment I may need? What is the procedure if there is not a good fit with the provider and the patient? Is the agency certified by Medicare? Are they approved or accepted by the patient's insurance plan or supplemental insurance? How does the agency handle expenses and billing? Do they provide detailed explanations of all the costs associated with prescribed needs? Remember the task at hand is to secure appropriate and compassionate care for your loved one. Though it may seem that ample time is not always given, it is wise to make the time to ask questions and arrive at the answers to your personal satisfaction. A positive experience is possible for everyone involved when you make an informed decision.